Large and well crafted Florida Gold will guide you from the keys to NASA. Welcome to mud skipper paradise. A simple happy people, so named after the small mud skippers that live in the local streams. Fish, wine and mud cakes are the main food sources of the land. Mud furniture and autos are made here and prized the world over. Mine mud gold and make money at the Federal Treasury to buy goods at the ports. Workers and tools added to the local industries will boost production levels. Bears love to eat the grapes in the mountains…so watch out! So grab your fishing pole and pack a lunch and climb aboard the Mud Skipper Railway. 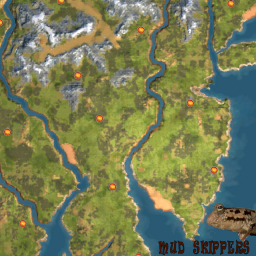 Mud Skippers is a rebuilt default game map. It has been re-sized from a size 10 to 16. Much landscaping and terraforming went on as well. 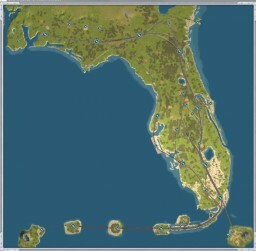 The map is built as a self-contained game map and must be the only mod map in the usermaps folder. Place the single Mud Skippers map file folder inside your UserMaps folder…start the game. 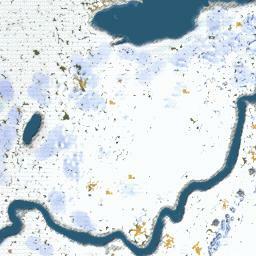 Remember to remove the map folder from usermaps when you switch to play a new mod map. Make a new folder where you keep your self-contained maps for storage etc. First constructed in 2007, now updated for 2009 with added trains. There are new industries and two distribution centers to help control all goods. Three types of passenger traffic. Visitors spend gold in your cities as they travel and shop. Gather your Gold to purchase goods at the ports, Passengers work the bulk industries increasing production, as the Elves work the in-city industries increasing production. Built as a single player long play map…use the Ohio Holiday Funds so you have enough money to get things rolling. Lots of trains and dual engine sets. Follow the victory goals in each era as your railway expands…and hurry Santa needs your help.